Christians, throughout the United States, would love to be able to join a affordable, Christian resort system that makes it possible for them to visit hundreds, of beautiful, first class, beach, lake, and mountain resorts, year round. And believe me, US Christians possess the ingredients needed to create a fabulous concept like this! Just fathom the idea of US Christians, or, a Christian resort company, developing lots of new, spectacular, Christian resorts, with large hotels, and high rise hotels, and plenty of outstanding amenities, in: West Florida, East Florida, Orlando, Lake Tahoe CA, North Carolina, Flathead Lake MT, Michigan, South Carolina, Colorado, New York, Cancun, etc.! The value of real estate, all around the world, is only going to appreciate this century; so investing in US Christian resorts and resort land, represents nothing but capital profits and gains for Christian investors to reap. What does it take to finance a $400 million – $1.2 billion resort? What do most hospitality companies do about this – the expense situation? They co-own and co-produce their resorts! They create resort joint ventures!! So, Christians need to examine this idea further; because they possess all of the resources and ingredients needed to accomplish all of this! So, read “How To Finance A Christian Resort”; and find out how it all really works. “How To Finance A Christian Resort” covers resort: development, finance (joint ventures), accounting, construction, and management, issues. 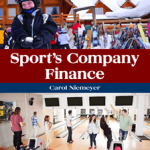 “How To Finance A Christian Resort” also examines resort amenity, sport's entertainment, and entertainment, issues, too. Believe me, a Christian resort system can/could produce a outstanding Christian entertainment concept composed of Christian: concerts, musicals, plays, praise events, and movies! “How To Finance A Christian Resort” explores this Christian resort issue. “How To Finance A Christian Resort”, also, recommends that the modern Christian resort have a shuttle bus system in place, that would shuttle Christian resort customers around to enjoy local tourist venue. 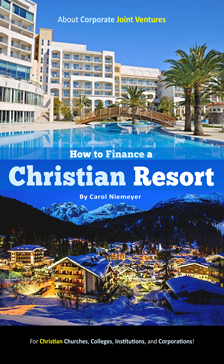 “How To Finance A Christian Resort”, also, examines in-depth resort amenity finance and construction; and it covers popular amenities like golf courses, pools with water park slides, mini-indoor theaters, etc. ! “How To Finance A Christian Resort” also examines the Christian resort issue of “specialty camp resorts” like Christian Sports Camp Resorts, Christian Music Camp Resorts, and Christian Film Camp Resorts, for Christian teens and 20's to participate in. Christians could also build adult “specialty resorts” devoted to various hobbies (writing, art, hobbies) or developing US minister’s skills. Christians could also build their own ski resort and condominium developments. Resort ownership can be, both, lucrative and fun! 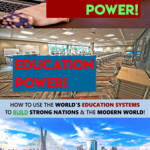 So read “How To Finance A Christian Resort”; and find out how to create a multi-million dollar, Christian resort and resort company, today! It's easy! So don't delay!